Akitas are great pets, but they need a firm, no-nonsense upbringing. In a Tokyo railway station there stands a statue of Hachiko, an Akita who waited nine years for his master, who had died at work. Testament indeed to the resolve, will and loyalty of the breed. These traits, coupled with an Akita's protective instinct, make confident, assertive training essential. Give your Akita regular physical contact as soon as he is separated from his mother and litter. This should happen no sooner than six weeks after birth. Stroke him, give him toys and get him used to human contact. If he nips at you, mimic the response of his litter mates and give a high pitched “yelp.” This is how puppies tell each other off when things get too rough. It’s important to discourage this behavior early, as uncorrected nipping in a protective, powerful breed like the Akita can lead to big problems later on. Walk him around the house and yard on a long leash. Let him explore but use the leash to keep his movement in check. 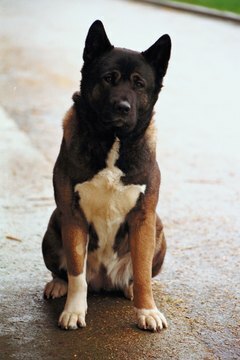 If he tries to pull away, gently restrain him and say “heel.” Akitas are naturally very bold, so get him into the habit of walking by your side from an early age. Introduce your Akita to family and friends while he is still very young. Encourage others to play with him so he becomes accustomed to being touched. Tell the kids not to play chase with the Akita. The breed has a strong prey drive, so this sort of behavior will stimulate his hunting instinct. Hold a biscuit in front of his face. Move it so it passes over his nose, behind his head. Say “sit” as you do this. As he follows the treat, he’ll eventually park his bottom on the floor to get a better look. Release the treat as soon as he sits. Give verbal praise and physical fuss to reward the action. With plenty of repetition, your Akita will learn that the sitting action has a positive outcome and will eventually do so on command without the need for a treat. Use the same principles to teach the “down” command, but instead of moving the treat over his head, move it from his nose toward the ground. The sit and down commands are very useful for keeping unwanted behavior in check. Go for regular walks, but always leash your Akita. Exercise is essential for this high-energy breed, as it relieves boredom. It also enables him to learn manners when around new people and dogs. Give verbal praise intermittently for as long as he walks politely by your side. Correct any misdemeanors, such as pulling and barking at other dogs or people by changing your walking direction and removing the praise. Use the leash to gently guide him if necessary. This distracts the dog from his previous action. Issue the sit command directly after distracting him. Issue the down command, then give him verbal praise. This shows him that you’re in charge, an important lesson to learn for these strong-willed dogs. Use a nonpull harness to control your Akita if he develops a pulling problem. What Is a Mini Bulldog? Can You Teach Tricks to Dandie Dinmont Terriers?